Those of us who are Brewers fans knew that this season was not going to end with a divisional title. I think what most of us hoped for was a competitive team that showed glimpses of what may be coming down the road… young, exciting players who could turn the fortunes of the franchise around in a few years. In many respects, I think the team has done just that. There is, however, a disturbing element of the Brewers’ game that needs to be addressed: strikeouts, and I don’t mean when a Brewers pitcher is on the mound. The Brewers bats are striking out way too much. Let’s throw the statistical lens down and see what the numbers show. The Brewers rank dead last in most games played this season where the team’s batters struck out five times or less. The Brewers have had only five such games in 2016. The Los Angeles Angels rank first with 45 games. In fact, 23 of the 30 MLB teams have played at least 15 or more games where their batters struck out five or fewer times in a contest. Not surprisingly, the Brewers rank first this season with 47 games where their batters have struck out 10 times or more. The team seems to have a pretty distinctive line this season of when they win and when they lose based on the number of times their batters were struck out in a game… the Brew Crew is 16-16 (.500) when the team’s batters strike out eight times or less in a game; they are 24-38 (.387) when they strike out nine or more times in a game. The team issue with strikeouts is obviously having an effect on several individual players. 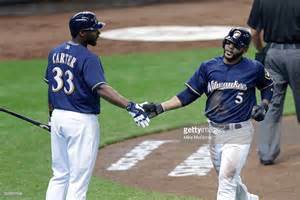 First-year first baseman Chris Carter leads the team with 22 HRs and 54 RBI, although his batting average is a paltry .220. Carter also leads the team in strikeouts with 124. He is on a pace to exceed 30 homers for the season, but he is also on pace to eclipse the 150-strikeout mark in the season. He would become the seventh Brewers player in team history to have 30+ home runs and 150+ strikeouts in the same season if he continues at this pace. Here’s a look at the Brewers batters who reached 30 HR and 150 K in a season. Another Brewers first-year player, Jonathan Villar, has been a pleasant surprise with a .299 batting average, a .383 on-base percentage that leads the team and stellar play at shortstop… not to mention that he leads the league in stolen bases with 34. Strikeouts, however, have been an issue for Villar. He has 103 for the season. Villar is on a pace to get very close to 50 stolen bases for the year and 150 strikeouts. No Brewers player has ever reached these two numbers in the same season. In fact, only two players in MLB history have ever had 50 or more steals in a season and 150 or more strikeouts. The two: Delino DeShields (56 steals-151 strikeouts for Montreal in 1991) and Juan Samuel (72 steals-168 strikeouts for Philadelphia in 1984). Could Villar become the third member of this unique club? No doubt the Brewers are headed in the right direction. They need, however, to figure out a way to lessen the number of strikeouts accumulating on the offensive side.